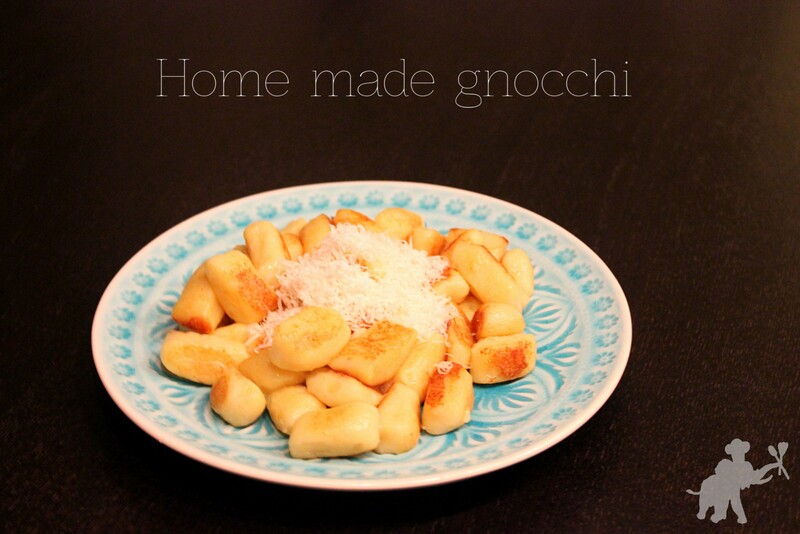 Home made gnocchi sound fancy, but the recipe is pretty simple. In fact, it really isn’t much more work than making pancakes! Parboil the potatoes, then peel and mash while they are still warm. 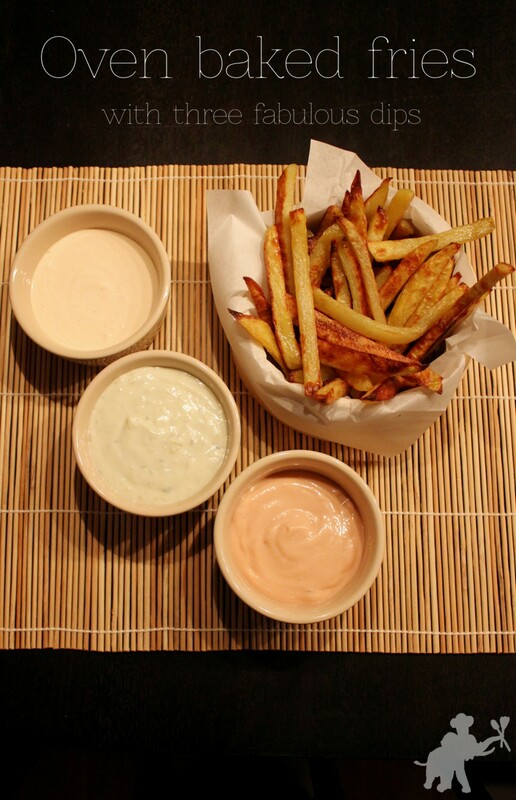 On a clean work surface, quickly combine potatoes, flour, egg yolk and salt until smooth. If the dough is still sticky, add a little more flour. On a cutting board, form four 1.5cm/0.6in thick rolls, then cut them in 1cm/0.4in pieces. 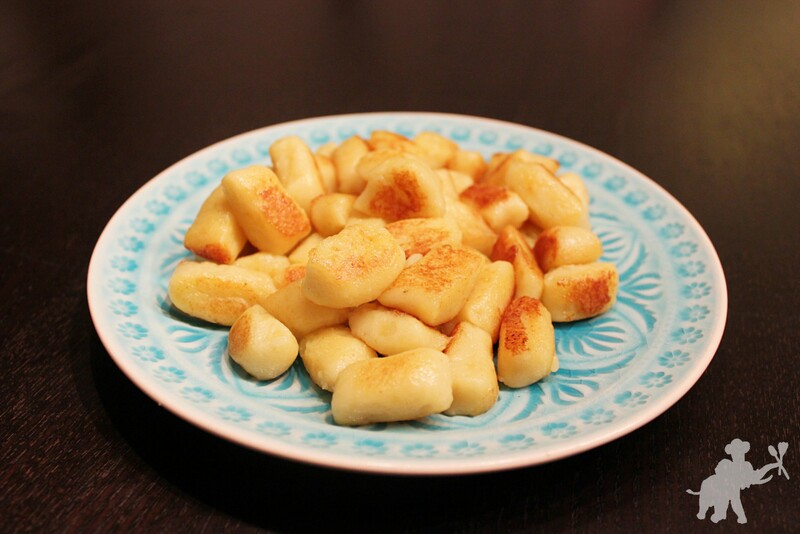 Cook the gnocchi in salted water until they come up to the surface, then remove them from the water using a slotted spoon. Don’t throw them all in at once, work in three or four batches. Set aside. In a large skillet, heat the butter and olive oil. 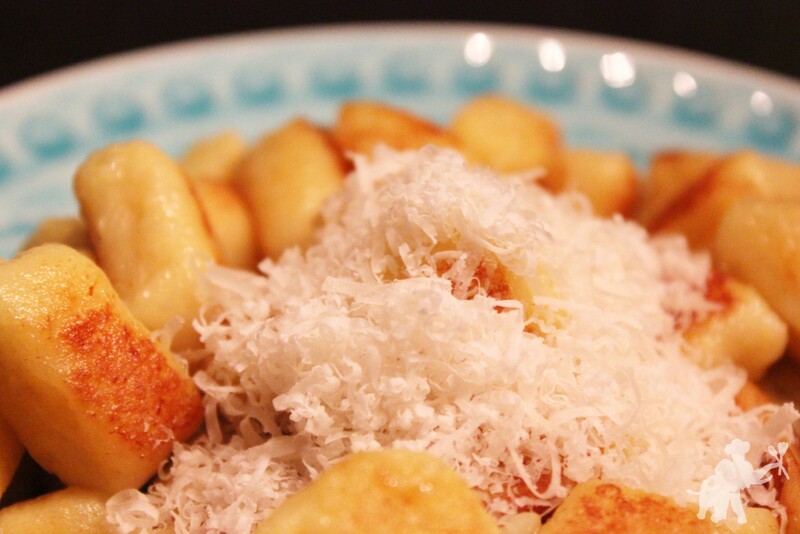 When the fat is hot, add the gnocchi. Let them brown a little from all sides. When they are golden brown, sprinkle with parmesan cheese and serve. 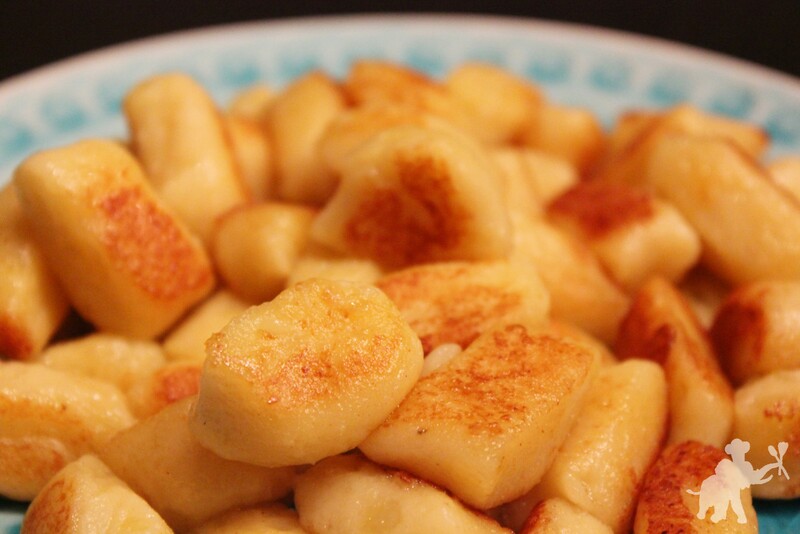 You don’t have to sauté the gnocchi. But I like them a little crispy! 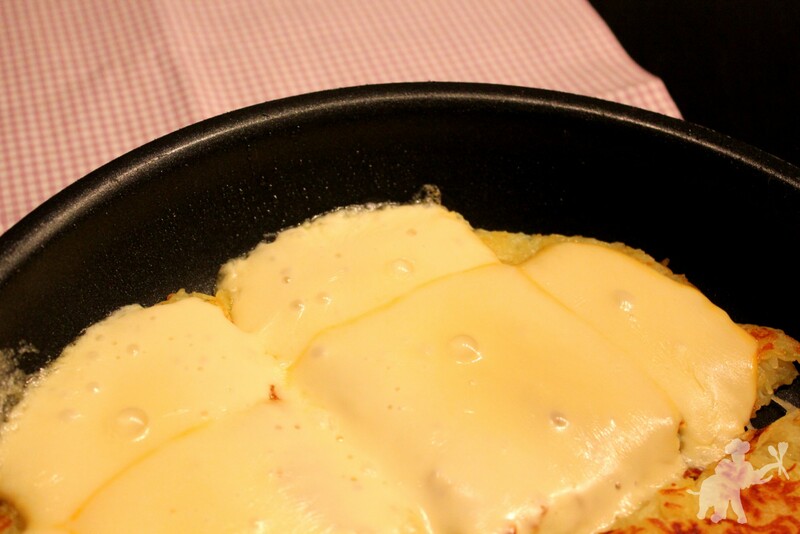 When I think of Swiss food, I mostly think of cheese – like cheese fondue and raclette and the Swiss cheese as such. Another thing is chocolate, it has a long tradition there as well. Also there are a lot of cakes that are typical for Switzerland, such as the “Zug Kirsch cake” (contains a lot of cherry schnapps, Audrey Hepburn used to love it) or the “Rüeblitorte” (basically a carrot cake). So where was I supposed to start when I saw Tomateninsels blog event the other day? She is currently on a “vegetarian world tour” on her blog, presenting vegetarian recipes from a different country every month. February is all about Switzerland over at the Tomateninsel. Obviously the rösti is a Swiss national dish as well – and it consists of potatoes, our Veggie of the Month! It just has to be my dish for Tomateninsel’s Switzerland month. So let’s get right into it! Parboil the potatoes in salted water for 20 minutes. Rinse with cold water, allow to cool a few minutes, then peel the potatoes and let them cool completely before moving on to the next step. 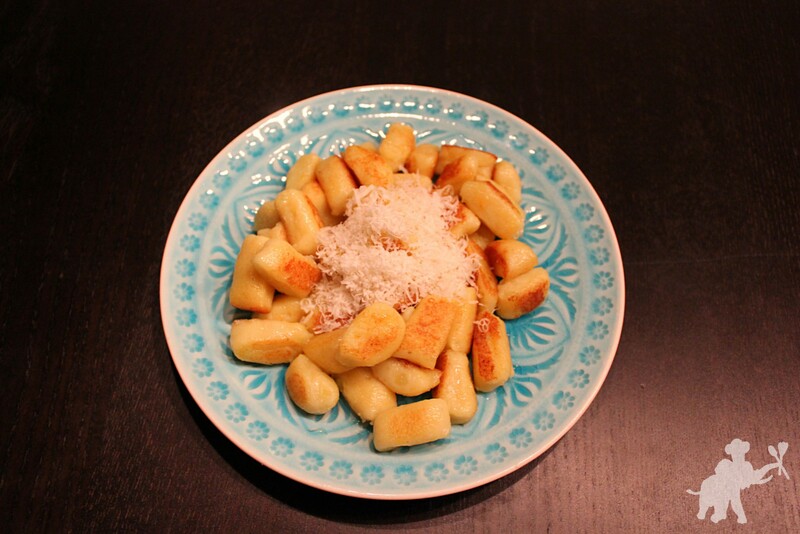 Coarsely grate the potatoes into a big bowl. Heat 1 tbsp of clarified butter in a skillet over medium heat. Add the potatoes, spread them to cover the skillet’s bottom, slightly pressing with a spatula. Season with salt an pepper. Let it cook for ten minutes. After 10 minutes, place a lid of a pan large enough to cover the rösti on top of the skillet and turn it around, so that the rösti sits on the lid. Add 1 tbsp if clarified butter to the pan. When hot, carefully slide the rösti, cooked side up, back into the skillet (depending on the angle, securing the top end with a spatula to keep the rösti from flipping over). Cook for another 10 minutes. 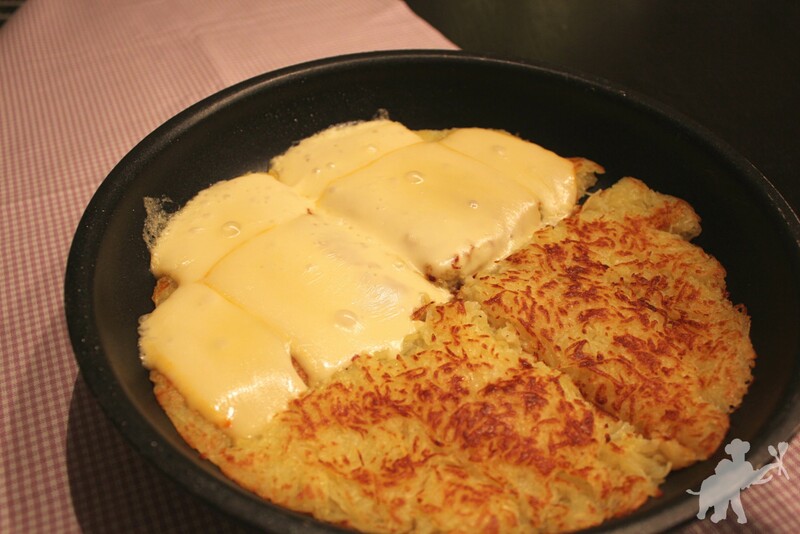 Divide the rösti in four pieces using a spatula. 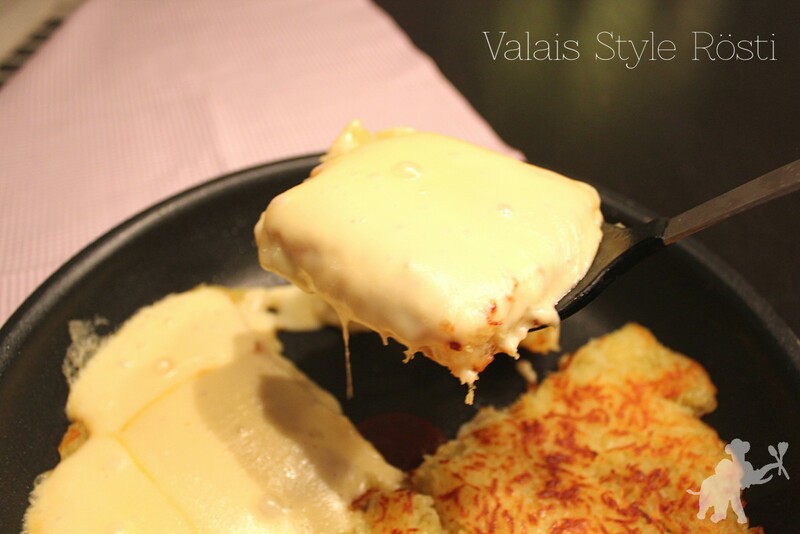 Place two slices of Raclette cheese on top of each piece, let it melt a little, then serve. 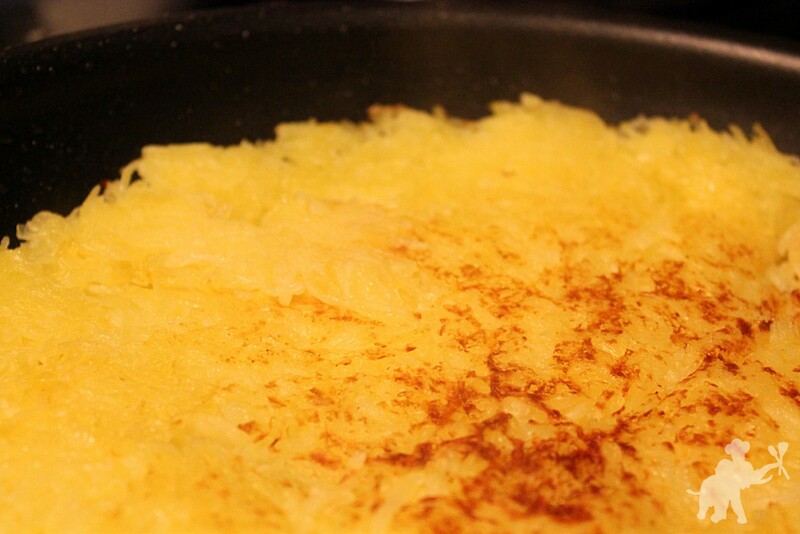 Parboil the potatoes the day before you plan to cook a rösti. That way, you have cooled potatoes when you want to start making dinner. 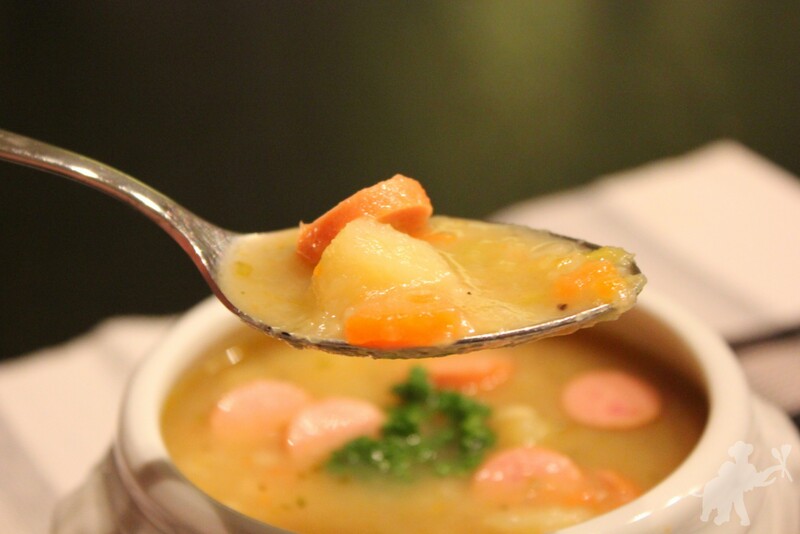 Potatoes are super-versatile and part of many typical winter dishes. 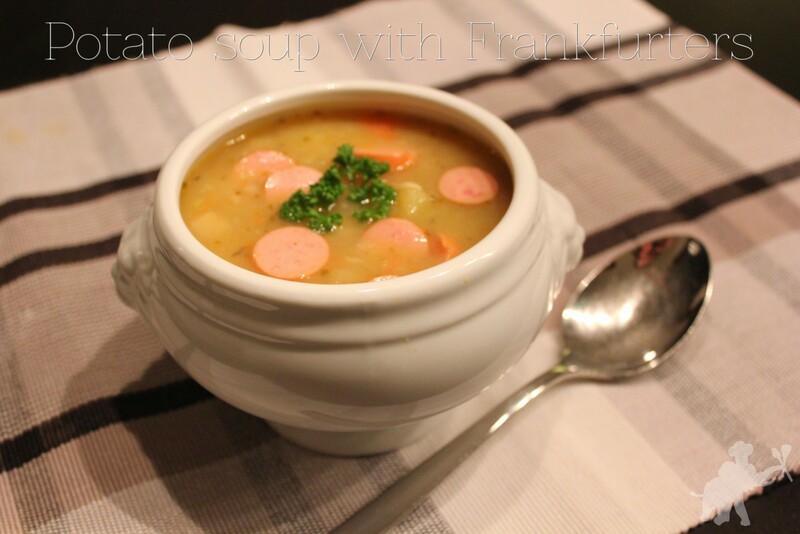 I’ll be cooking four of them this month, starting with a winter classic: a potato soup. 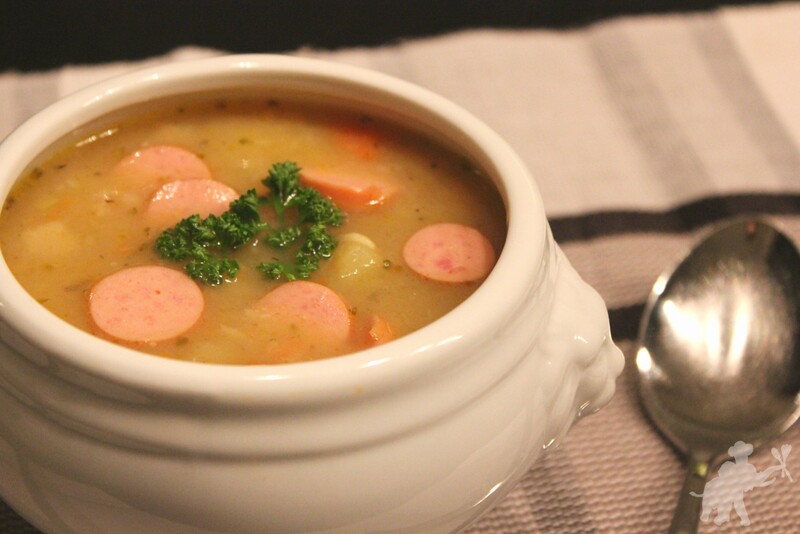 In fall and winter or whenever it’s really cold and rainy outside (which can be pretty much anytime between september and april around here), it is a good time to make a big pot of potato soup. It is very easy to prepare and it reheats well – you can make a big batch and keep the leftovers in the fridge for two days. I think stews taste even better when you reheat them the next day, so reheating is really more like thinking ahead than dealing with leftovers. Right? Peel the potatoes and cut them into 1.5cm/0.6in cubes. Peel and chop the onion and the garlic. Wash and cut the leek into thin rings. Peel the carrot, quarter it lengthwise and cut into thin pieces. Peel the celery root and cut into small pieces. A lot of cutting, but you’re done now! Heat canola oil and butter in a large saucepan over medium-high heat. Sauté onion and garlic, then add leek, carrot and celery. Stirring occasionally, let it cook until the vegetables brown slightly. Then add the potatoes and the vegetable broth. Bring to a boil, then turn the heat down to low and cover with a lid. Let simmer for 30 minutes. After 30 minutes, season with salt, pepper, marjoram and thyme. Puree just a little using a hand blender to give the soup a creamier consistency. Ten or so pulses should do the job. Add the cream cheese and stir in. 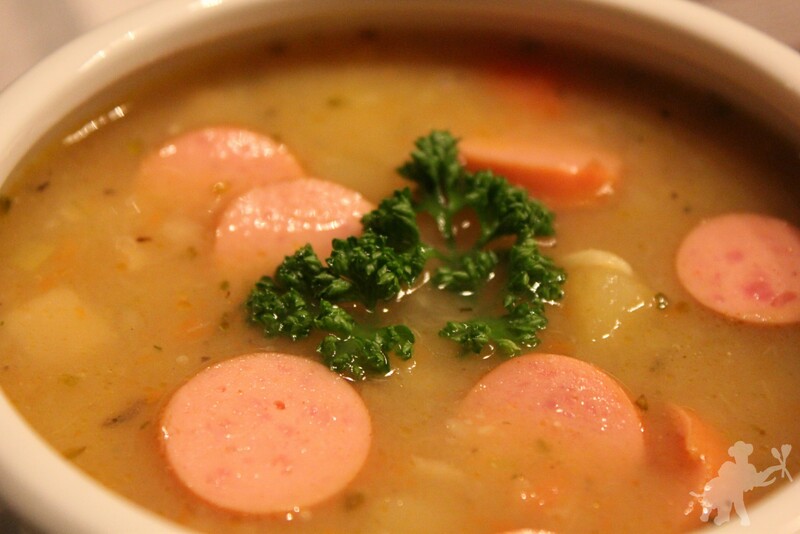 Cut the sausages into slices, add them to the soup and cover again with a lid (don’t let it boil). After a few minutes, it’s ready to serve! Decorate with fresh parsley.